Book summary: Sarah Howard’s first year at the university is everything and nothing she expected especially when a very cute boy named Ben in her Art History class starts to show interest in her. She’s determined not to get burned again. But in her heart of hearts, what she really wants is a Jane Austen kind of romance. Ridiculous, right? That kind of romance doesn’t exist anymore . . . or does it? Sarah is smart and fun to be around and even pretty, despite her Medusa-like red curls. She even plays the guitar. (So does Ben!) Yes, Sarah is everything Ben has wanted. He’s crazy for her, but Sarah is just not getting it. She’s playing hard to get, and if she’s not careful, she’s going to lose a real hot gentleman — her 21st-century Mr. Darcy. Start writing something new. Watch a movie in the middle of the day. And cook a lot. I have a red leather reading chair that sits beside the fireplace. That is a great winter reading spot. In summer, I love to read outside in the sunshine. (I know. I know. I have read the warning labels. But I love the sun.) I write in the kitchen when the family is all gone. That so does not work when anyone is home. I loved “The Secret Garden” – but I didn’t discover it until I was 14 years old and working in the public library. I fell so in love with the illustrations by Tasha Tudor. So gorgeous. Remember Joe Jackson? 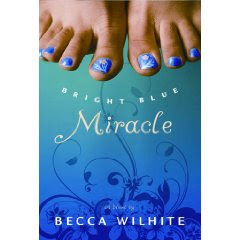 How about “Be My Number Two” for Bright Blue Miracle. What do you find so appealing about the genre you write for? Would you try writing for a different genre? I love writing YA, because I am totally intrigued by the learning phase of life. I love the “firstness” of YA themes – discovery and understanding, growth and messing up. I love to do contemporary YA comic fiction, because I think real life if pretty darn funny. And I have recently started writing a few short chapter-books, for those early-reader types. That’s fun, too. Becca has donated one copy of My Ridiculous Romantic Obsessions to our readers and we have one to add as well! Click here to enter. Two chances to win.